Now, I’m not talking about jobs where there is a last-minute nature to the job. A firefighter’s job, is, by definition, a “last-minute” kind of job. The firefighter’s boss will no doubt say, “We need to do this right away!” But there is a lot of preparation that firefighters engage in – with the aid and coordination of their bosses — that goes into meeting the demands of that “last minute” request known as a fire. I’m talking about a boss who interrupts your job to request something new, and it is needed soon. And this request is made with urgency, perhaps with some yelling involved. These are requests that are metaphoric fires, not actual fires. So if you are someone on a team that seems to have a lot of “fires”, then read on. 1. Is the request primarily to assure the manager looks better to his manager? A common source of this kind of last minute request is to provide assistance to the manager in helping him report up to his manager what is going on, most likely the request of the manager above her. So, ironically, the request keeps rolling downhill. If you have an organization with more than three levels, you have at least three “sources” for needs for updates. If the upper management team does this consistently, such last-minute requests can start to appear to be the norm. For example, let’s say that the upper management decides to schedule an “all team meeting” and wants all of managers in the group need to present to the team. And it’s going to happen next week. Last minute request spawned! In my previous article, I discuss how a necessary component of leadership is setting and articulating a strategy. If this is not done, then leaders become managers executing a strategy that has not been articulated, and, in essence, multiplying the number of managers executing a non-existent or randomly generated or constantly changing strategy. In other words, chaos. In an earlier article, I discuss how one way to assure managers actually know the strategy is to ask them what they think the strategy and ask those reporting to the managers what they think the strategy is. Now lets combine the two. Let’s go ahead and ask people in the organization what they think strategy is. Whether there is an articulated strategy or not, this process will, in essence, reveal what people in the organization think the strategy is. The last few articles I’ve published describe some tips for helping managers – strategy executors – to better understand and articulate an organization’s strategy. But perhaps I’m getting ahead of myself here – do the leaders even know the organization’s strategy and do they articulate it? Let’s take a look at two grids developed by the Manager by Designsm blog. If your organization has a strategy, it’s probably important that your managers – the strategy executors – be able to understand, articulate, and interpret the strategy well. If not, then this is bad management design. 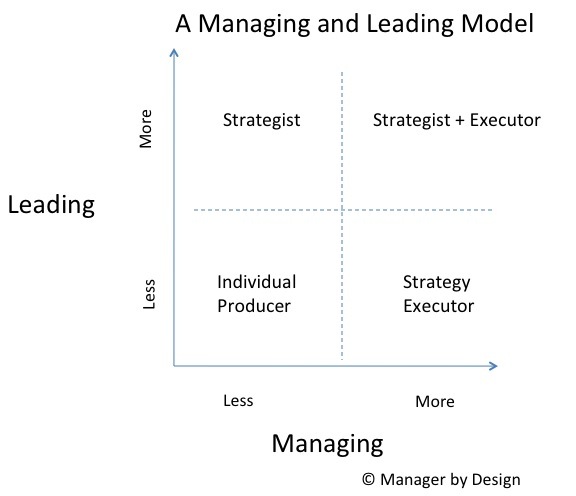 The Manager by Designsm blog’s leadership/management model makes the distinction of managers as strategy executors and leaders as strategy developers. So it is important that the managers be able to understand, articulate and interpret the strategy well. But this should be designed to be done smartly and not in a haphazard way. An example of being sloppy in the design of “including the managers” is through having the management team regularly sit in on leadership meetings. This is a big waste of time, and would no doubt chart as low quality meetings. e) There needs to be an end to this process so the manager can go back to managing (not a standing invitation). As a bonus, if the strategy development process is an involved one, the managers involved would be temporarily relieved of their duties as “strategy executor” manager, with the understanding that they will go back to this role. In this process, not only will the manager become better at managing, in that she (and her employees) will be able to articulate and interpret the strategy better, but she is also is aware of the strategy development process as a specific process, allowing her to become a better “leader” in addition to being a better manager. As an extra bonus to including a manager in the strategy development process, the strategy itself will likely be better, as she can provide the needed perspective from the “strategy executors” on what they need to execute the strategy, and whether the strategy is going to work. As a double extra bonus, she will be to assist with the strategy implementation to other managers, assist with the ongoing interpretation to the other managers, all things that seem to assist with the current needs of the organization. In short, this is “leadership development” while doing the current job better. The alternative I have seen is to have leadership development happen external to the job – -usually through a leadership development class or series of classes. These are effective at introducing the concepts, but do not allow for immediate applicability. This time delay will usually mean limited (if at all) application of the concepts. If you need classes at all, a better design would be to have the “strategy process” be taught to the manager (strategy executor) just prior to participating in the strategy development process. 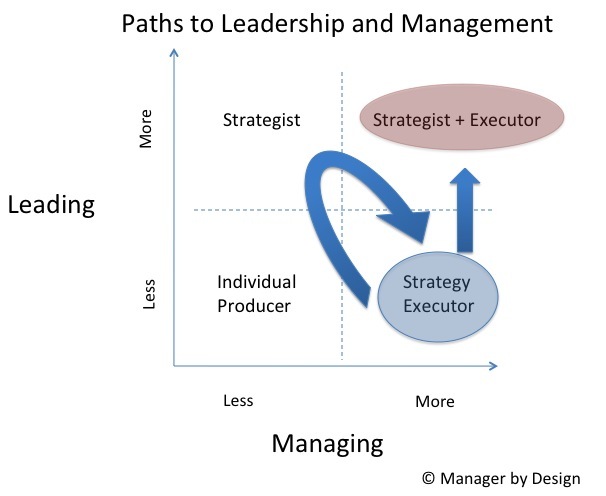 Does your organization include the managers in the actual strategy development process? Or does it rely on developing its leadership through either classes or “sink or swim” methods? 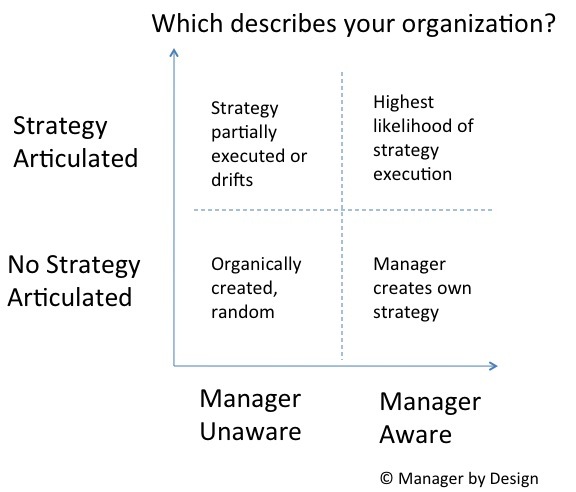 Do your managers know the strategy of your organization? How do managers learn strategy? The Manager by Designsm blog has recently been focusing on how managers – or “strategy executors” – can better align their work to . . . strategy executors. 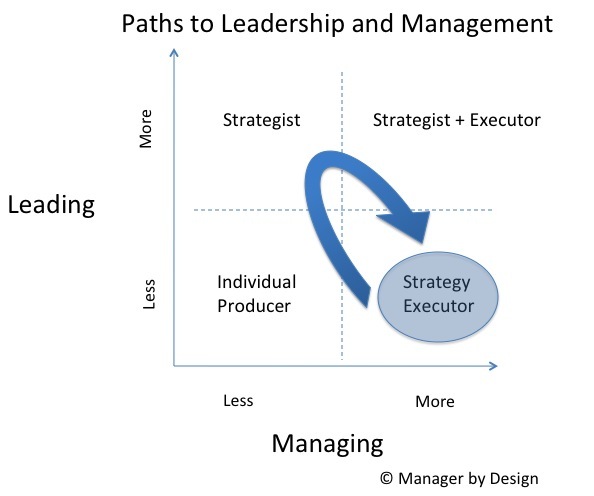 The Manager by Design blog believes that managers are strategy executors and leaders are the strategy developers. In my previous article, I provide tips for infusing the strategy into the manager’s goals/objectives, and testing whether the managers – and their employees — can articulate what the strategy they are supposedly executing is. But managers need better performance support than simply putting the strategy in their goals. You want to make sure your managers are capable of making good interpretations of the strategy, and have some sort of specific and immediate feedback on these interpretations. Makes sense, huh? But how would you describe how your organization provides ongoing support for helping the manager interpret the organization’s strategy? It’s one thing to have a group that develops the strategy, and it’s another to have that group accessible to help interpret the strategy. A strategy is, in essence, a summary statement of intent by leadership, so there are times when those who are carrying out the intent need to check in on whether their understanding of the intent is correct. To help with this, check the communications paths that are available to your managers. Do they have access to those who went through the strategy development process? Do they even know who developed the strategies? On the flip side, do people in the group who developed the strategy know who will be executing the strategy? If not, then there is a much lower likelihood that the strategy will be understood or interpreted by the strategy executors. First, I’m assuming that there is a strategy development process in the organization. If this is not the case, then perhaps it is time to consider one. If you do have such a process, how do you include the managers in the process? Many times the “inclusion” is the “announcement” of the strategy as a handoff to the managers, and that is it! But this, too, is a low percentage proposition in assuring your managers can understand, re-articulate and make good decisions based on the strategy. One way to improve this “handoff” is to identify how managers are included in the process of strategy development when the process takes place. You don’t have to include all managers, and it doesn’t have to be the same managers each time the strategy development takes place. In doing this, no only do you assure that you have management inclusion, but when the strategy is “announced”, there are resources (see point 1) that are nearby that can better articulate the intent of the strategy and how it should be interpreted. There are other benefits for including managers in the strategy process. In my next article, I’ll provide tips on how to include the managers (a.k.a., strategy executors) in the strategy development process and what some benefits of this process are. The Manager by Designsm blog defines “management” as being the role of strategy execution, assuming your organization has a strategy. 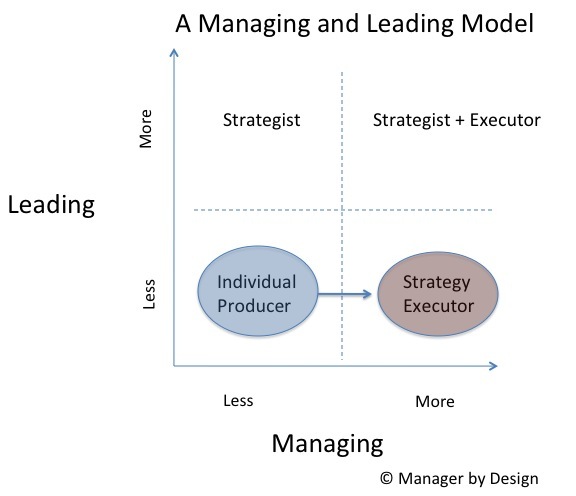 (See here for more on this topic of the management vs. leadership model). So one key to great management would be to assure managers are aware of the strategy, can articulate the strategy, make good interpretations of how the strategy translates to actions, and give feedback on how to improve the strategy. How to make sure this happens? You want your managers to be good at strategy execution, and part of this is being able to understand and appreciate the strategy that is being executed. As part of the management design, you want to make sure that this understanding, articulation and evaluation of strategy execution is included into the manager expectations. Have you ever had a manager who wasn’t able to really articulate why they were doing the things they were doing it? Instead, they are enforcing something? Or actively subverting the strategy? These are often bad managers. If they are bad at understanding the overriding strategy, their decision-making will be poor, their credibility with the workforce will be limited, and the results will not be aligned with the strategy. Most organizations, both at the highest level and the departmental level, are supposed to have a strategy. And the managers of these organization are expected to execute that strategy. Seems simple enough, but let’s test these assumptions. Think about your organization. What is the overall strategy? Can you articulate it from memory? Can you look it up somewhere? What activities are you doing in your department that support the strategy? Do you know where the strategy comes from? Now think about your department and the managers in it. Do they know the organization’s overall strategy? Can they articulate it from memory or look it up somewhere? Do they know where it comes from? And. . . do they have a strategy articulated for how they execute the larger strategy? In this view, I’ve placed four general possibilities in the grid. On the Y-axis, we have the scale of whether the overall organization has a clearly defined and articulated strategy. The lower on the axis, the less the strategy is articulated and the more it is assumed to be implied, or, perhaps, completely lacking. On the X-axis, you have manager awareness of the strategy. Sure it’s important to have a strategy, but how aware are your managers of it? The further you go to the right on the X-axis, the more the manager is able to articulate and interpret the strategy. In this notion, the individual producer becomes in charge of the team doing the producing. The new manager is in charge of “strategy execution.” This is a fine model if there is some structure and feedback in performing the new managerial role, and a terrible model if there is no structure and feedback. It all depends on the management design of the organization. Are the managers designed to be great? Or are they left to their own devices in determining and creating their management practices? Assuming that the manager has guidance in the core people management practices, there is another potential flaw with this scenario: The manager does not develop strategy skills or does not appreciate the act of developing strategy. If your organization is looking to create leadership capability (in my model, the “develop strategy” quadrant), then there are a few paths that can be designed in to help with this potential design flaw while doing the job of managing. Having elements like these in your management design will improve how managers who are in charge of strategy execution understand better the strategy, and, in turn, execute the strategy. The emerging field of Management Design must take this into consideration, and create designs that encourage the interaction and handoff between strategy and strategy execution. It is the goal of the emerging field of Management Design to encourage managers to seamlessly execute the strategy of an organization. If it is being done poorly or haphazardly, then you will not get strategy execution, a main task of management. You may get some sort of execution, but will you get strategy execution? In upcoming articles, I’ll discuss these potential designs for assuring that managers know the strategy, contribute to the strategy process, and develop their own strategy setting skills.